Former Alabama backup quarterback Phillip Ely led the Toledo Rockets to a 16-12 win over No. 18 Arkansas on Saturday. Ely threw for 237 yards on 21 of 38 passing with a touchdown. Running back Damion Jones-Moore ran for 68 yards on 10 attempts and a touchdown. Brandon Allen threw his first interception for the Razorbacks since November 1, 2014. He had gone 134 attempts without making the mistake. 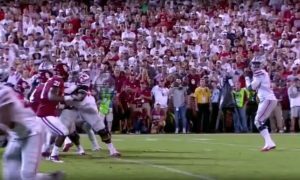 The senior quarterback then missed on two passes in the final six-seconds, and one of them would have been a touchdown if he didn’t overthrow his tight end Hunter Henry. Allen finished the game 32 of 53 passing for 412 yards and an interception. 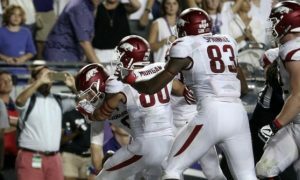 Its fair to say that Arkansas got away from the type of football they’re known for, the physical running style attack. Running back Alex Collins ran for just 54 yards on 20 carries and one touchdown. Toledo got ahead on a five yard touchdown pass from Ely to Corey Jones and the missed the two-point conversation. Arkansas would eventually retaliate with a touchdown of their own to take a 7-6 lead over the Rockets. Toledo kicked a field goal right before half to make the score 9-7 and the Rockets never trailed again.